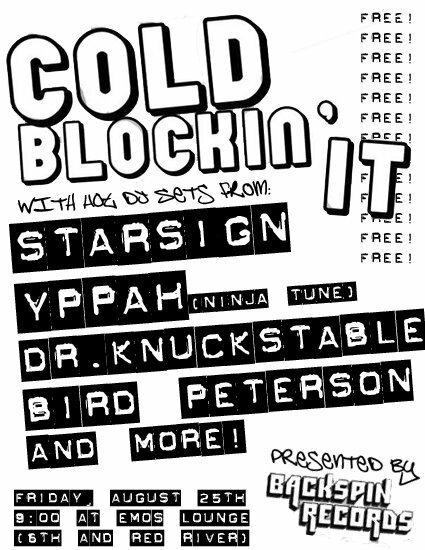 Desperately needin' somethin' to cool us off from this sweltering heat... Backspin Records presents Cold Blockin' It! 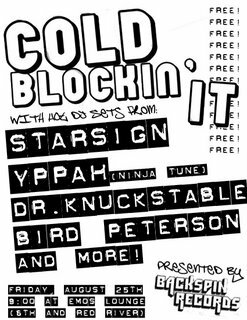 at Emo's Lounge on Aug. 25th with DJs Starsign, Yppah, Dr. Knuckstable, and Bird Peterson! Oh yeah... and let me count... it's FREE! FREE! FREE! FREE! FREE! FREE! FREE! FREE! FREE! FREE! FREE! FREE!